The summer may be ending soon, but there’s no shortage of Tiki events, including Ohana: Luau by the Sea in Fort Lauderdale and Mod Palm Springs in California coming in early October. 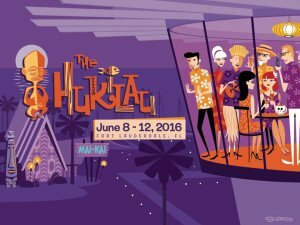 Check out previews of both, plus this month’s Tonga Room 70th anniversary in San Francisco, a Tiki cocktail history seminar in D.C., Tiki Day at Disneyland, and Thee Hot Rod Luau in Southern California. 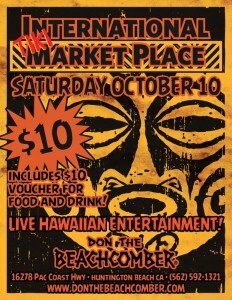 We also have recaps of the recent Fong Fest in Chicago, and Don the Beachcomber’s International Tiki Market Place. 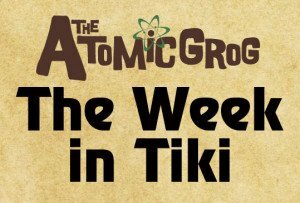 Plus news from the Chicago Area Tiki Tour and a possible Tiki bowling establishment coming to Atlanta. Regular features honor the late Florida artist Wayne Coombs; South Florida’s Cutback Surfband; the Bootlegger Tiki bar in Palm Springs; and the Ministry of Rum website. 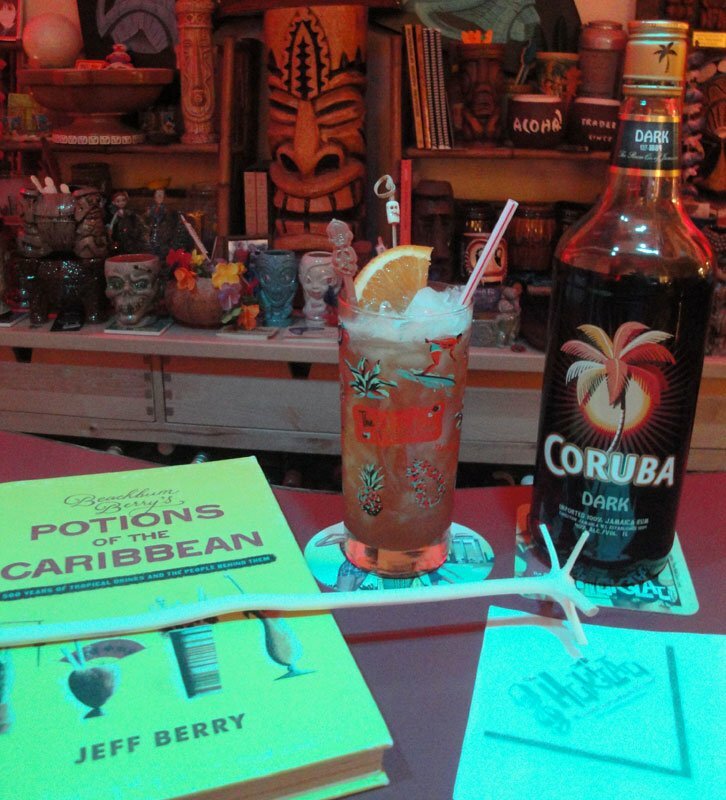 The rum of the week, Coruba Original, is featured in a vintage Planter’s Punch. 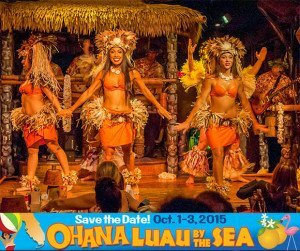 Don’t miss out on the very first Ohana: Luau by the Sea, set for Oct. 1-3 in Fort Lauderdale. Online ticket sales will end at 8 p.m. Eastern time on Monday, Sept. 21, so the organizers can get an accurate head count and prepare for their Saturday night luau at the Sheraton Fort Lauderdale Airport hotel, headquarters of the event. There will be no same-day ticket sales. Brought to you by the Fraternal Order Of Moai – the same friendly, fez-wearing folks who earlier this year presented the sister event Ohana: Luau at the Lake in upstate New York – this inaugural event is being hosted by the charity organization’s Gumbo Limbo chapter in South Florida. 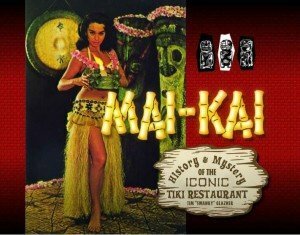 Attendees can enjoy live music, DJs, seminars, contests, a rum tasting, vendors, auctions, prizes, food and the legendary dinner show at The Mai-Kai restaurant. Tickets are $85, or $135 if you pair it with a limited edition event mug by PopTiki of Colorado. Thursday, Oct. 1: The Kick-Off Party starts at 7 p.m. at Fort Lauderdale’s Kreepy Tiki Bar & Lounge, just around the corner from the Sheraton, featuring live music by South Florida’s The Zoo Peculiar and Jangle Leg. Adjacent to Kreepy Tiki Tattoos & Boutique, the lounge has undergone a transformation over the past year with a commitment to quality hand-crafted cocktails to match the venue’s vintage decor. The party will be themed to a circus sideshow, with both the bands and cocktails getting into the Barnum & Bailey spirit of the event. Friday, Oct. 2: Daytime activities at the Sheraton kick off with a tasting room and “great rum challenge” presented by the Miami Rum Festival from noon to 3 p.m., followed a carving demonstration by Deland’s DeTiki and ukulele lessons from Tony Baloney, both held poolside. 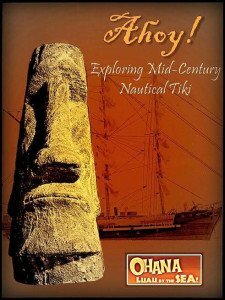 At 4 p.m., Tiki historian Mike Skinner will present “Exploring Mid-Century Nautical Tiki,” a seminar that explains how Tiki bars were influenced by the spirit of adventure of sailing the high seas and exploring the South Pacific. In the evening, the party shifts to the historic Mai-Kai for a special happy hour for Ohana guests from 7 to 9 p.m. Catch Cutback Surfband, (this week’s Band of the Week) in The Molokai lounge before and after dinner while enjoying the 58-year-old establishment’s vintage cocktails. The climax of the evening is dinner in the showroom, featuring The Mai-Kai’s Polynesian Islander Review, the longest-running authentic South Seas stage show in the United States, including Hawaii. After dinner, there will be more entertainment outdoors on the Lanai. Dinner reservations must be made directly with The Mai-Kai at (954) 563-3272. There will be a bus available from the hotel to The Mai-Kai for $20 round-trip. 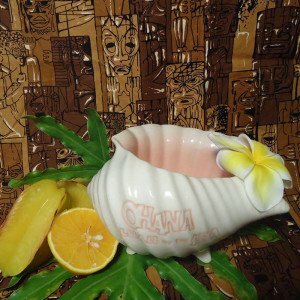 The official Ohana: Luau by the Sea mug by PopTiki. Saturday, Oct. 3: Back at the Sheraton, daytime poolside activities include Tiki Bingo, the Ohana Marketplace, the charity gift shop and silent auction, plus lunch and drink specials throughout the day. In the evening, the Ohana Luau begins at 6 featuring dinner and dancing plus a stellar lineup of entertainment beginning around 7: Tampa exotica ensemble Stolen Idols; Taiko drumming by South Florida’s Roy and Malia Anderson (aka Marina the Fire Eating Mermaid); surf guitarist extraordinaire Skinny Jimmy Stingray from nearby Deerfield Beach; and 9th Wave, the official band of Ohana and one of the premiere surf bands in the Northeast. Sunday, Oct. 4: A special bonus activity wraps up the fun as Fort Lauderdale’s Fwaygo Rum opens the doors of South Florida Distillers and welcomes Ohana guests for a private tour and tasting. While there’s plenty to do throughout the weekend, the schedule is not packed with activities. “The goal of the whole weekend is to have enough to do to be entertained and still have enough time to hang our with your friends,” explained one of the organizers, Chip Kerr. Expect many “unofficial” activities to crop up. Did someone say “room party”? Like many FOM events, proceeds from Ohana: Luau by the Sea benefit the Easter Island Foundation. The money raised goes toward scholarships for the citizens of Rapa Nui. Most of the money is raised via the silent auction and gift shop, which are made possible by a wide array of sponsors. In turn, many sponsors are supported by selling their wares in the marketplace. The first Ohana: Luau by the Sea sponsors include Cockspur Fine Rum, El Dorado Rum, Brinley Gold Shipwreck Rum, Rhum Clement, Richland Rum, Tiki Club Rum, Cherry Heering, Orgeat Works, Re’al Ingredients, Barritt’s Ginger Beer, Royer Corp., Frankie’s Tiki Room, Tiki Magazine & More, Tortuga Tile Works, Fashiontramp Fashions, and Cats Like Us. Ohana has a special rate for the weekend at the Sheraton Fort Lauderdale Airport. Click on the official site below for more info. 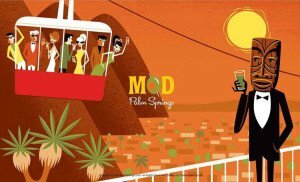 The third annual Mod Palm Springs, scheduled for Oct. 8-11 at the Caliente Tropics resort, will be a showcase for mid-century modern style and the artwork of Shag, aka Josh Agle. Presented by the the same folks behind Shag the Store and Tiki Caliente, the event will also offer a taste of exotic, retro and Tiki culture (along with a few cocktails). The Caliente Tropics, the historic host hotel, is sold out for Friday and Saturday nights. But you can still buy full weekend wristbands (for $85) and book at room at one of the two hotels next door (the Motel 6 and The Royal Sun). The wristband gives attendees full access, including the Caliente Tropics pool and hot tub. The official 2015 Mod Palm Springs mug, manufactured by Eekum Bookum, is one of the most intricate mugs designed by Shag. Mod Palm Springs is all about art, architecture, music, fashion, and cocktails, all favorite topics of the acclaimed artist who will serve as the event’s master of ceremonies. Shag also designed the the official Mod 2015 mug, which is being produced by Eekum Bookum. This limited edition (just 150 mugs) will be available only at the event (. The Mod Palm Springs wristband gives guests access to events at the Caliente Tropics after 6 p.m. on Thursday, Friday and Saturday (plus a Sunday seminar by author Pete Morruzi). For an additional $95, you can also pick up a ticket to one of two exclusive Sunday home tours/parties at Shag’s desert hideaway in the historic Royal Hawaiian Estates. “Deviled Eggs and Daiquiris” will include exactly that, plus a chance to mingle with the artist who has defined modern Tiki style. The two Saturday tours are sold out, along with the “Cocktail Climb” with Shag aboard the Palm Springs Aerial Tramway. Performing bands at Mod Palm Springs include the Martini Kings and the Jimmy Psycho Experiment on Thursday; The Martini Kings with Kate Campbell, Marty Lush and Brassiere ’66, and Tiki Tronic on Friday; and Fono 66, The Outta Sites, and The Do-Its on Saturday. Emcees and hosts include Marty Lush, Rory “Wildsville Man” Snyder, and MiShell Modern & Jay Nailor. The Tonga Room in San Francisco, the world’s longest-running Tiki bar and restaurant, will celebrate its 70th anniversary on Wednesday, Sept. 23, with a “Tiki Chic” party (see Facebook event). Running from 10 p.m. to 4 a.m. in the historic subterranean lair in the basement of the The Fairmont hotel, the party is pricey ($99, plus fees) but includes two cocktail tickets, a buffet, passed hors d’oeuvres and a gift bag (get tickets). Built in 1945 in what used to be the hotel’s swimming pool, the Tonga Room still includes a lagoon in the pool space with a band performing on a floating barge. It recently underwent a $1 million restoration and modernization of its cocktail menu. An all-star panel of experts will participate in a prestigious, sold-out seminar, “History of the Cocktail: Tiki & Exotic Drinks,” on Saturday, Sept. 26, in Washington, D.C. Moderated by bartender, consultant and journalist Naren Young, the seminar includes panelists Jeff “Beachbum” Berry (author and owner of Latitude 29), rum collector and historian Stephen Remsberg, and former Tiki restaurantaur David Chan. Attendees will taste specialty cocktails and learn about Tiki’s genesis following the repeal of Prohibition, the influence of returning American servicemen from the South Pacific, and the the rise of icons Don the Beachcomber and Trader Vic and their legendary secret recipes. This seminar is part of a series paired with the museum exhibit “Spirited Republic: Alcohol in American History,” which opened March 6 and runs through Jan. 10 in the Lawrence F. O’Brien Gallery at the National Archives. 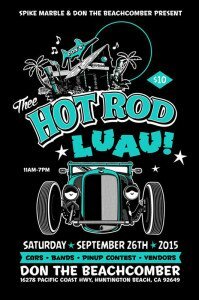 A new event will get fans of Tiki and hot-rod culture revved up in Southern California on Saturday, Sept 26. Thee Hot Rod Luau is an all-day event featuring bands, a car show, a pinup contest, artists and vendors, plus more at Don the Beachcomber in Huntington Beach. Organized by Spike Marble of The Hula Girls (who will be performing), the event will be headlined by surf-punk icons Agent Orange and also feature rockabilly, old-school rock ‘n’ roll, and surf from The Rayford Bros., Pat James and the No Names, Buddy Lee and the Dungaree Dogs, Outerwave, and The Mai Tais. Admission is just $10. 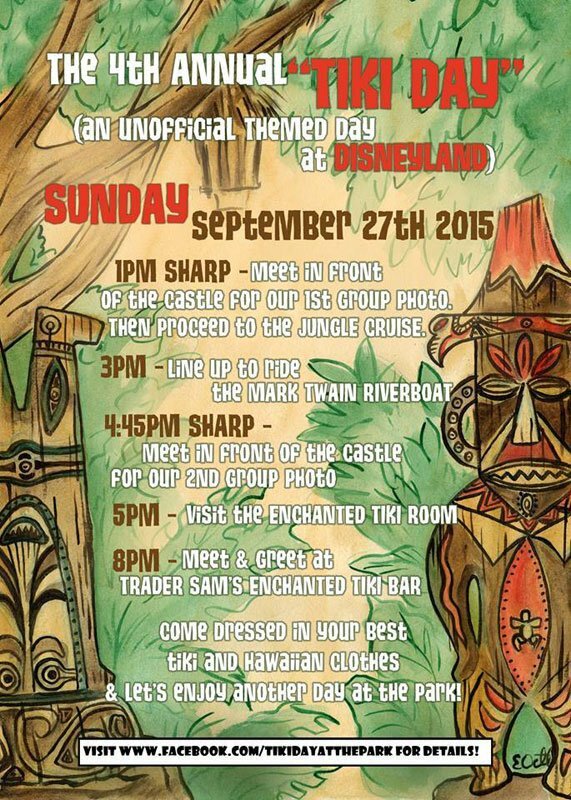 Fans of Disney and Polynesian Pop will gather at Disneyland on Sunday, Sept. 27, for the fourth annual Tiki Day, an unofficial celebration featuring meet-ups, group rides, and a meet-and-greet at Trader Sam’s Enchanted Tiki Bar. There will be giveaways, plus participants are encouraged to wear their Tiki finest for the group photos. The fourth annual Fong Fest, held Sept. 12 at Chef Shangri-La outside of Chicago, was not only a fun-filled music and Tiki-themed event, it raised $2,300 for charity. Proceeds of the raffle will go to aninal shelter CatNap from the Heart. The vintage Tiki-themed Chinese restaurant, opened by the late Paul Fong in 1976, hosted a full day of festivities including surf, lounge, rockabilly, and exotica bands plus a vendor marketplace and more. Attendance was said to be the highest ever. Look for an even bigger Fong Fest in 2016 to celebrate the 40th anniversary of Chef Shangri-La. Also reaching a new high in attandance was Don the Beachcomber’s International Tiki Market Place on Sept. 12 at the historic restaurant in Huntington Beach. [See photos on Facebook] More than 50 booths filled two two rooms and included a who’s who of contemporary Tiki artists (Bamboo Ben, Tiki Diablo, Tiki Tony, Ken Ruzic, Doug Horne, et al.). 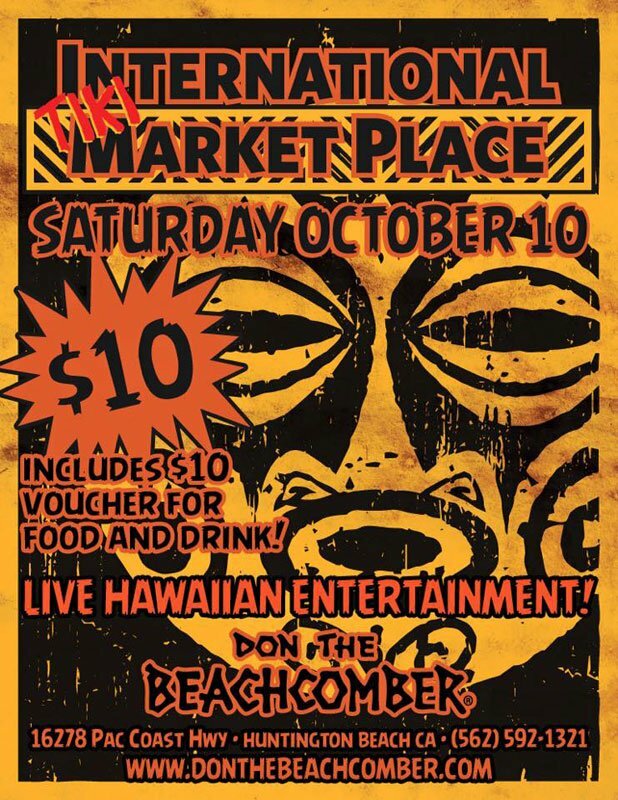 Don the Beachcomber will host the next International Tiki Market Place from from 10 a.m. to 3 p.m. on Saturday, Oct. 10 (see Facebook event). 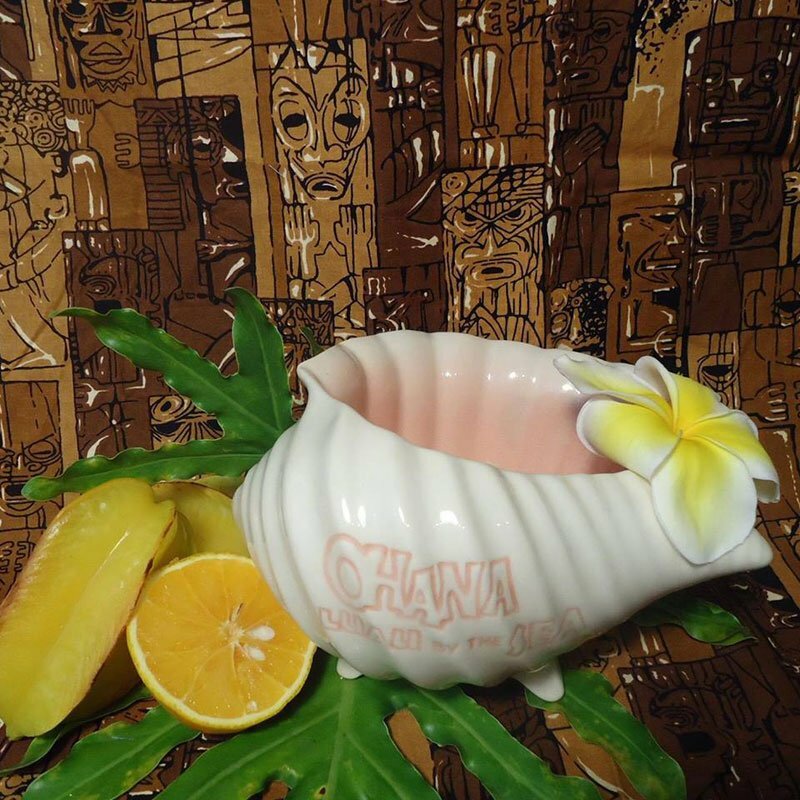 QUICK HITS: Chicago Area Tiki Tour donation, Tiki bowling coming to Atlanta? The Chicago Area Tiki Tour raised $2,500 for the Easter Island Foundation during its April 24-26 event. The Red Palms chapter of the Fraternal Order of Moai announced the donation, which will fund the Fraternal Order of Moai Roger Carlson Memorial Scholarship in honor of the late FOM member who passed away in September 2014. 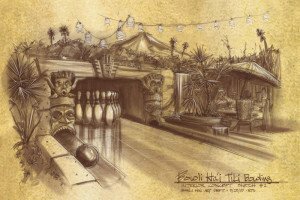 A website and social media pages have launched touting a “Tiki bowling and adventure lounge” coming to Atlanta in 2016. Check out BowliHai.com for news, concept art and construction photos. 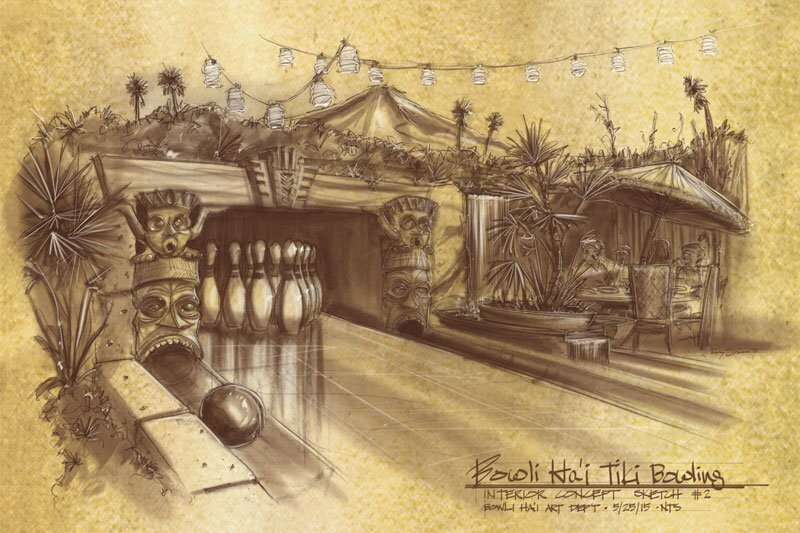 The site currently contains three cool pieces of Bowli Hai concept art, plus a promise of “Tiki bowling, tropical refreshments and untamed adventure from the South Seas” coming to the northside of Atlanta. 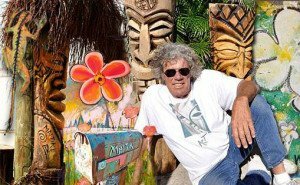 It’s already been three years since the passing of the legendary carver and artist who made an indelible mark on the Tiki scene for more than 40 years. Wayne Coombs was doing what he did best, working in his humble Cocoa Beach studio, when he had a heart attack at age 62 on Sept. 4, 2012. The expressive Mai Tiki style of carving he developed with his signature Guard, Scream, Warrior and Joker figures became known worldwide as “Florida style.” Go to tropical-themed bars and restaurants anywhere in Florida and you’re likely to run into a Mai Tiki carving. Coombs was also known for his primitive masks, later concentrating on paintings and opening a gallery on the Mai Tiki grounds. The area is now a hub for the local arts community known as Mai Tiki Market. 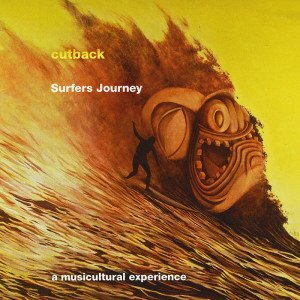 The core members of Cutback first played together during surf music’s heyday in the 1960s, but they didn’t unite as a classic instrumental combo until 2002. Named for a popular surfing technique, the band ended a long recording gap with the release of the acclaimed Surfers Journey album in November 2014. The 14 original songs – including stand-outs Surf Fever, Tubo Mexicana, 151 Rum Swizzle, and Conan the Surfarian – show off the band’s vast chops and classic rock roots. While deeply rooted in the style and spirit of surf rock (and culture), Cutback also dabbles in rock guitar dynamics and breaks up the instrumental songs with spoken intros about surfing. You can always find Cutback tearing it up in The Molokai bar at The Mai-Kai in Fort Lauderdale, typically on the first Friday of every month. 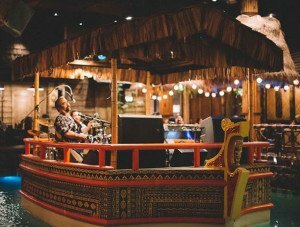 Don’t miss Cutback Surfband will be peforming in The Molokai lounge at The Mai-Kai in Fort Lauderdale on Friday, Oct. 2, during Ohana: Luau by the Sea (see preview above). 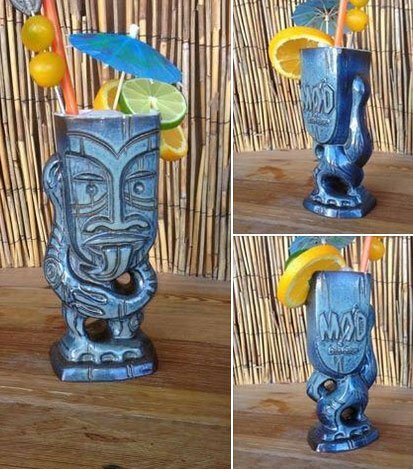 Located in the historic former “Don the Beachcomber building” at 1101 N. Palm Canyon Drive in Palm Springs, Bootlegger Tiki has a daunting legacy to live up to. But by all accounts, the bar that opened at little over a year ago is doing just fine, thank you. The restored, original Tiki torches from the Don the Beachcomber restaurant (which dates back to 1953) still adorn on the roof of the mid-century modern building, lending an air of Tiki history to the space. With authentic Tiki-inspired decor (bamboo, thatch, pufferfish, velvet paintings), the space is small, dark and cozy. The drink menu includes both modern craft cocktails and classics, including Jasper’s Jamaican and Donn Beach’s original recipe Mai Tai, Zombie and Cuba Kula. Cocktails are made to order with fresh juices and house-made syrups. Owned and operated by the proprietors of the adjoining Ernest Coffee Co. (named for Ernest Raymond Beaumont Gantt, aka Donn Beach), the bar opens at 4 p.m. for happy hour seven days a week. Both venues also share a scenic patio with mountain views. 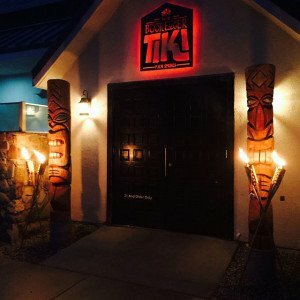 Don’t miss Bootlegger Tiki is sponsoring the Friday-Saturday room crawl and hosting room parties at Mod Palm Springs at the nearby Caliente Tropics resort on Oct. 8-11. You can also taste the bar’s Daiquiris during the event’s Saturday-Sunday “Daiquiris and Deviled Eggs” parties and home tours at the Palm Springs getaway of the artist Shag. See event preview above. A gathering place for fellow devotees created by rum expert and importer Ed Hamilton (Caribbean Spirits), this treasure trove of spirited information includes more than 50,000 forum posts by members. Many of the world’s most knowledgeable rum drinkers and bloggers are members, so if you’re looking for authoritative info there’s no better place to start. Interested in a new rum? A site search will usually yield informative reviews and cocktail recipes. The site also contains many educational features, such as interviews, articles, “Rum 101,” a glossary, FAQ, and a great list of more than 200 blenders/bottlers and distilleries worldwide. Don’t miss: Rum festivals are coming up soon across Europe, including Italy (Sept. 26-28), Germany (Oct. 3-4), and the United Kingdom (Oct. 17-18). See the event listings below. A rich Jamaican rum that shines in Tiki cocktails, Coruba Original, known as Coruba Dark in the United States, is sweet and medium bodied with a smooth finish that makes it a great entry-level dark rum. It’s also arguably better than many similar rums at a much lower price, making it a great bargain. Molasses is prevalent but not too intense, allowing a host of other flavors (vanilla, citrus and apricot) to make themselves known. Coruba Original dark is a blend of pot and column still rums aged for at least two years in heavily-charred American oak barrels, with caramel added for color and flavor. The flagship Coruba rum comes out of the venerable J. Wray & Nephew distillery, which also produces the highly-regarded Appleton Jamaican rums. Rich and luxurious despite its simplicity, this classic recipe perfectly showcases dark Jamaican rum in much the same way the similar lime-sugar combo does for white Cuban rum in the original Cuban Daiquiri. 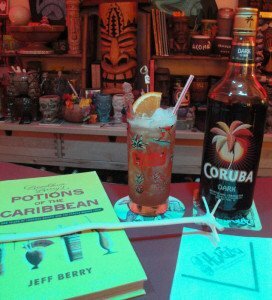 Corbua really shines in this version of the historic drink, which Berrry says was served at Jamaica’s Hotel Titchfield. Berry recommends the syrup be made with equal parts white cane sugar (organic if possible) and hot water, stirred until dissolved, then chilled. You could also try the “cold process” method by shaking the sugar vigorously with room-temperature distilled water until it dissolves intio a lighter, crisper syrup. Either way, you’ll discover why this is one of the key cocktails that inspired Don the Beachcomber to create the canon of tropical drinks that continues to inspire generations of Tiki afficionados. 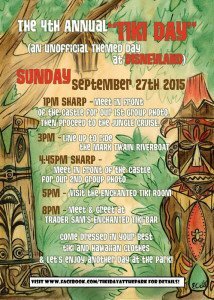 * Sept. 27 – Tiki Day at Disneyland, Anaheim, Calif. This entry was posted in Art, Cocktails, Culture, Events, Events, Events, Events, Events, History, Mai-Kai, Music, Recipes, Restaurants, Reviews, Rum, Rum festivals, South Florida, The Week in Tiki, Tiki mugs and tagged Beachbum Berry, Bootlegger Tiki, Bowli Hai, Caliente Tropics, Chef Shangri-La, Chicago Area Tiki Tour, Coruba, Cutback Surfband, Disneyland, Don The Beachcomber, Easter Island, Eekum Bookum, Fong Fest, Fraternal Order Of Moai, Fwaygo Rum, International Tiki Market Place, Kreepy Tiki, Mai Tiki, Mai-Kai, Ministry of Rum, Mod-Palm Springs, Ohana: Luau by the Sea, Planter's Punch, PopTiki, Potions of the Caribbean, Shag, The Hula Girls, Thee Hot Rod Luau, Tonga Room, Wayne Coombs. Bookmark the permalink.